Luke Shaw is expected to leave Man United in the summer. 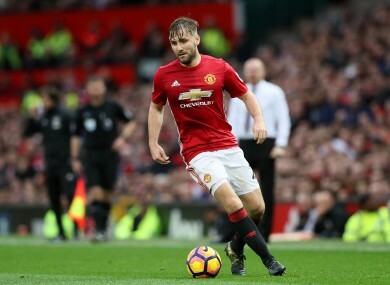 The Independent report that Luke Shaw could be set to leave Man United having found first-team opportunities at Old Trafford hard to come by since Jose Mourinho took over. The same paper also suggests that the Red Devils are confident of signing Atletico Madrid and France star Antoine Griezmann this summer. Real Madrid’s Alvaro Morata is being targeted by Chelsea to replace Diego Costa, who is now expected to leave the club in the summer, while former player Romelu Lukaku is also being linked with Antonio Conte’s side. Middlesbrough and AC Milan are keen on Gerard Deulofeu, though the latter are understood to have had a loan bid rejected by Everton. Man United are reportedly hoping to get another two seasons out of Zlatan Ibrahimovic. West Brom, Hull, Swansea and Sunderland are all interested in out-of-favour Leicester striker Leonardo Ulloa. Scott Hogan’s move to West Ham is reportedly close, after the Hammers increased their bid to £13.5 million (€15.6 million) for the Irish-qualified Brentford striker. Surely one of the most astute signings in Premier League history, Okocha joined Bolton from PSG on a free transfer in 2002. After an injury-ridden start to Premier League life, Okocha ultimately won the hearts of Bolton fans, scoring the Goal of the Season against West Ham (see below) and playing an integral role in helping them to avoid relegation. He was made captain the following season, going on to make over 100 appearances for the club, before leaving for Qatar SC in 2006. Okocha then returned to England for a season in the Championship with Hull in 2007, though injuries limited him to just 18 appearances, and the midfielder ultimately retired at the end of the campaign. Since retiring, he has been linked with the role of president of the Nigeria Football Federation (NFF). Email “Luke Shaw set for United exit, Chelsea target Lukaku (again) and all today's transfer gossip”. Feedback on “Luke Shaw set for United exit, Chelsea target Lukaku (again) and all today's transfer gossip”.